Children love to ask questions. Asking questions is how they learn and get new information. Children can learn to apply questioning when reading to help them make sense of a book. Learning to ask a question and look for the answer is an important strategy readers use. It helps readers monitor their own understanding of what they are reading. Parents can help their children learn to ask questions while reading by using the Asking Questions graphic organizer on the IRRC website. The organizer is intended to guide children in asking questions before, during, and after reading. I used the Asking Questions Graphic Organizer with my children and their cousins on a recent trip to visit our family. There are two versions of this organizer on the IRRC website--one for pre-kindergarten through fourth grade, and one for grade five and up. 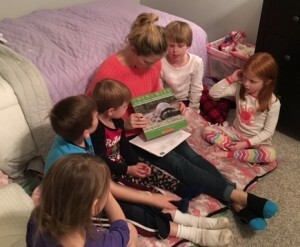 At bedtime, I planned to read them a non-fiction book about the unlikely friendship between an old tortoise and a baby hippo, and I thought it would be a great opportunity to use the organizer. Below, you will see steps for using this organizer while reading with your children as well as examples of our experiences using it. Explain how readers ask questions to help themselves better understand what they are reading. Help your child understand that not only should he ask questions about his reading, but he should also be looking for the answers. First, I gathered the children and explained that we would read a book and ask ourselves questions about what we read. I explained that readers ask questions to help them understand what they are reading. Next, I showed the kids the organizer and shared that we would be asking questions and looking for answers before, during, and after reading. Show your child the book and have her think of any questions they might have before you start reading. The graphic organizer provides some question stems that can give you ideas if your child initially doesn’t come up with her own questions. Help guide your child to think about what the book might be about or what she already knows about the topic. When I asked the children if they had any questions about the book we were about to read, I was delighted to hear Dom, the 3-year-old, chime in. He asked, “I wonder what’s in the picture?” His question set the stage for our focus on asking questions, and his brother and sister immediately raised their hands to ask their own questions. As they did, we jotted them down. I also invited them to help me by writing some of the letters or words on the organizer. I reminded everyone that we would look for the answers as we read. Choose a few stopping points in the book to have your child stop and think of questions he might have. He might be confused about a part and need to try to figure it out, or he might make predictions about what will happen next. The children had several great questions while we were reading the book. They asked questions such as, “Where did they put Owen?” and “Did they get him out?” Both of these questions were answered in the text in the next page or so. It gave me the chance to point out that as we read through the book, we were able to answer previous questions. We were learning new information as we read, and our questions helped us pay attention to the answers and keep track of what we were finding out. When you finish reading, guide your child in asking questions about what she just read. Help her think about what she might want to know more about or any questions the book didn’t answer. Our experience with this part was interesting. Rocky, my nephew, connected the African setting in the book to a TV show he had seen about poachers, so he asked if the people who helped the animals were poachers. We had a quick conversation about how we could tell they weren’t poachers (because they saved the animals) and, as a result, the other children learned a new vocabulary word. Ryan also had a great question in that she was wondering how the animals were doing now because the book was written a few years ago. We discussed how we wouldn’t be able to find that answer from the book, but that we might be able to look up the answer on the Internet. Using the Asking Questions graphic organizer takes very little extra time, but is a great tool for helping a child understand what he is reading. You can use the organizer together or, after learning about it, your child can use the organizer independently. Based on your child’s age, you can select the organizer for lower grades or upper grades. It is a great way for your child to organize his thinking and to think about his understanding of what he is reading.